"3.5 million Palestinian Christians and Muslims," Tarazi writes, referring to the Arabs under illegal Israeli occupation, "are denied the same political and civil rights as Jews. These Palestinians must drive on separate roads, in cars bearing distinctive license plates, and only to and from designated Palestinian areas. It is illegal for a Palestinian to drive a car with an Israeli license plate. These Palestinians, as non-Jews, neither qualify for Israeli citizenship nor have the right to vote in Israeli elections. In South Africa, such an allocation of rights and privileges based on ethnic or religious affiliation was called apartheid. In Israel, it is called the Middle East's only democracy." Tarazi, reflecting a small but growing body of Palestinian opinion, is tentatively proposing an end to legalized discrimination and daily humiliation through the creation of a single binational state, endowed with a pluralist constitution reflecting the multifaith diversity of the various groups inhabiting the Holy Land. From a Jewish perspective the flaw in this "one-state solution" is glaring, and Foxman has no trouble spotting it: "Mr. Tarazi's proposal is the latest of many efforts by Palestinian officials to subvert the existence of Israel in the garb of victimhood. In the old days it was manifest in an outright rejection of Israel's right to exist -- which Hamas and Islamic Jihad continue to advocate. Today, we see it in Mr. Tarazi's cynical proposal for one state, which of course would be the end of a Jewish state in Israel by overwhelming a Jewish majority through numbers." Israel, in Foxman's analysis, literally cannot exist without a Jewish majority, because a Jewish majority is what constitutes Israel as a Jewish state. Israel is Israel only insofar as it is a Jewish state with a Jewish majority, which means that non-Jews on the occupied West Bank and in Israel proper, survivors of Jewish ethnic cleansing, are at best irrelevant to Israel's identity and at worst a demographic time-bomb, capable of bringing about national annihilation. Israel will come to an end the moment Arabs outnumber Jews. 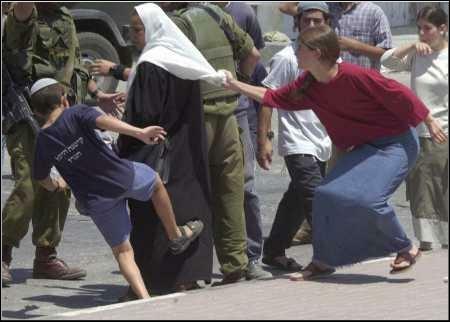 West Bank Jews "Celebrate Diversity" (Hebron, August 2001): A Palestinian mother, Samar Abdul-Shafti, is kicked by a Jewish boy while a Jewish woman rips off her Islamic headscarf. Many Zionist settlers in the occupied territories are former American Jews, and they are especially aggressive toward the native non-Jewish population. We should never tire of identifying Jewish hypocrisy on racial issues and never fear repetition. Foxman is the leader of an avowedly anti-racialist organization. Promoting racial diversity is his job, and whatever we may think of the ADL's mission, no one could deny that Abraham Foxman and the ADL work hard and work effectively at nurturing anti-White discrimination and racial balkanization in the United States. And they have a real record of solid accomplishment, including membership in the long list of Jewish organizations and Jewish politicians that opened American borders to the Third World in 1965. In this, as Kevin MacDonald documents, Jews were pursuing their own racial interests at our expense. A multiracial society strengthens Jews by weakening the dominant Gentile culture and diffusing power among a series of competing groups, with Jews assuming a leadership role within the squabbling alien nation created by non-White demographics. All talk from Jews of "diversity" and "equality" and "racial justice" is camouflage concealing their hidden agenda, as well as ad hoc propaganda concocted to discourage the Euro-American majority from acting as a cohesive group with legitimate interests of its own. Jews, it is true, can become tearily emotional when they speak of racial diversity, as though, gifted with special spiritual insight, they see in expanding non-White populations a moral progression away from primitive race loyalty and toward a new age of enlightened racelessness. "If you believe," the neoconservative Ben Wattenberg has written, "... that the American drama is being played out toward a purpose, then the non-Europeanization of America is heartening news of an almost transcendental quality." Yet we know for certain that such eloquent professions of anti-racialism are a sham, representing only a Jewish tactic, not a genuine belief. That is the most important lesson which broad Jewish support for Zionism teaches. If Wattenberg had also extolled the "almost transcendental quality" of some future dejudaization of Israel, we would be forced to concede his sincerity. Since he is in fact a Zionist, we can justly dismiss him as a fraud and accurately label him a political enemy, as we can all Jews who exhibit the same self-interested double standard. It is clear that no Jew can be at once a principled anti-racialist and a principled supporter of Israel, and since most Jews are both anti-racialists and Zionists, we can safely conclude that most Jews are unprincipled hypocrites, claiming a purported moral quality -- anti-racialism -- that they manifestly do not possess. Lying back of the proposed one-state solution to the Mideast conflict is Zionism's nightmare scenario, the return of the indigenous Palestinians expelled from their homes at the birth of the Jewish state. Israel was created by an act of the United Nations in 1947. It is therefore a legitimate nation, at least if we accept the UN as the arbiter of national legitimacy. Israel has, however, an unusual legal status that distinguishes it from all other legitimate nations. Subsequent UN resolutions, specifically Resolution 194 (December 1948) and Resolution 273 (May 1949), made Israel's admission to the world body contingent on its willingness to allow Palestinian refugees "to return to their homes." General Assembly Resolution 194, which has been reaffirmed annually, is the main legal basis for what Palestinians call the Right of Return. Somewhere between 500,000 and 800,000 Arabs were forcibly ejected from Palestine during Israel's War of Independence, and they and their descendants, now numbering about three million and strewn about the Middle East, are entitled to return under international law. Thus Israeli Jews, alone among the nations of the world, are legally obligated to "embrace diversity," though it is an obligation which they have not the slightest intention of fulfilling. When Abraham Foxman angrily dismisses the one-state solution, he is not merely rejecting diversity as a Euro-American nationalist would; he is rejecting diversity despite the existence of an international obligation to accept it. Multiracialists insist that Whites have a moral obligation to become minorities in their own nations, but only for Israeli Jews is the alleged moral imperative of majority self-dissolution coupled with a legal mandate. Should Israel acknowledge its legal obligations, accepting a single binational state and the Right of Return as matters of selfless principle, Jews in Israel would soon find themselves facing the same demographic threat that their Diaspora brethren have engineered for us. That so many Zionist Jews in the West remain anti-White activists under this unusual set of circumstances, that they continue defending an explicitly Jewish state while daily thinking up new schemes to further deracialize their host populations, requires a brazen racial chauvinism which only a race that regards hypocrisy as its birthright could ever practice. Originally published (2004-10-12) on National Vanguard.